After what seems like a never-ending gestation period, Subaru’s rear drive sports coupe, the 2013 BRZ, debuted at the 2011 Tokyo Motor Show this week. The BRZ name is awkwardly derived from the mash up of: Boxer Engine, Rear drive and Zenith (of Subaru’s automotive talents, apparently). 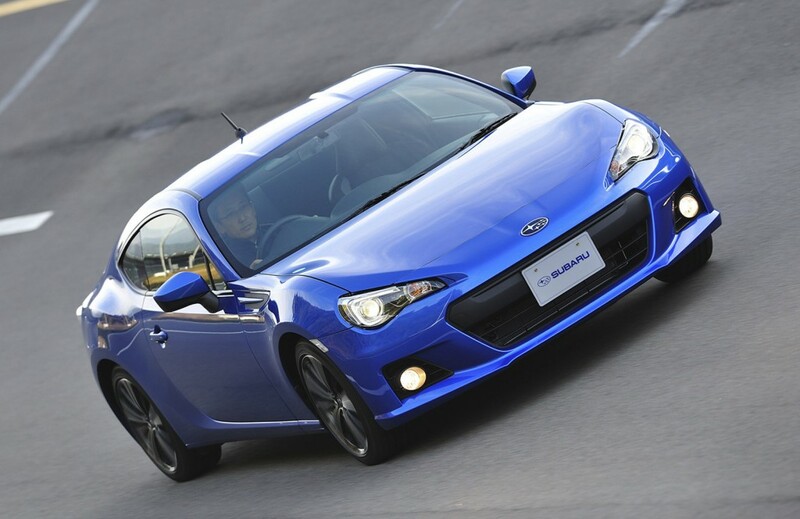 The 2013 Subaru BRZ was jointly-developed with Toyota. Subaru engineered the all-new engine and platform while Toyota donated engineering expertise and styling. The Toyota version is called the GT 86 or just 86 (an obscure reference to the “iconic” rear-drive version of the 1983–1987 Corolla, which was codenamed AE86). In the US, the car will be marketed as the Scion FR-S (or something similar to that). All cars (Subaru, Toyota and Scion) will be built at Subaru’s Gunma plant in Japan when production starts in spring 2012. 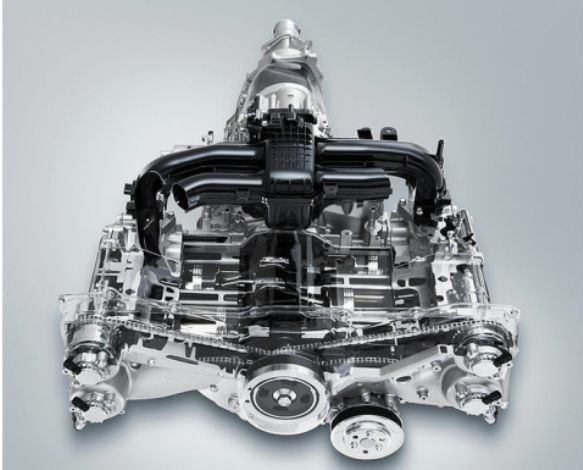 Aside from Porsche, Subaru is the only manufacturer making engines in which the cylinders lay flat, horizontally-oppose. When in motion, the cylinders appear to be punching at each other like two boxers. 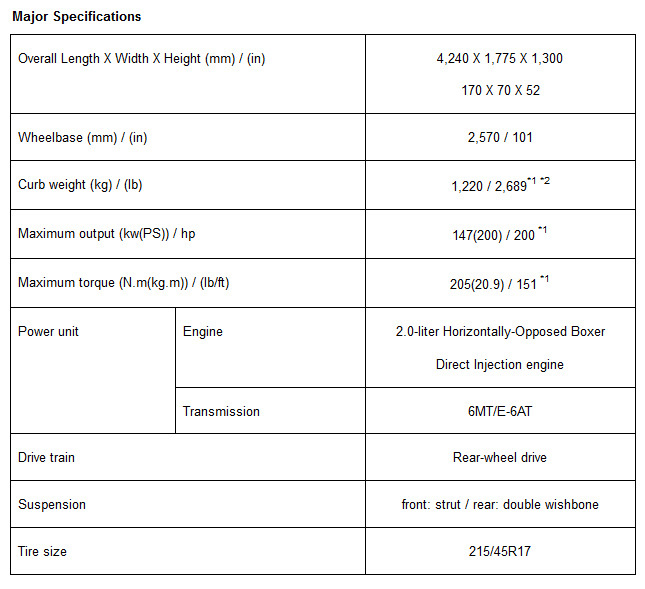 The all-new 2.0L Boxer 4 packs 200 hp and 151 lb-ft of torque. It’s made more compact by using a shorter intake manifold and a shallower oil pan. And for the first time, Toyota’s direct injection and port injection technology dubbed “D-4S,” is fitted to a Subaru boxer engine. The standard transmission is a 6-speed manual with a 6-speed automatic (hopefully with paddle shifters) optional. The flat Boxer engine imbues all Subaru vehicles with a lower center of gravity (CG) than cars using conventional engines. However, the new, lightweight, highly-rigid rear-drive BRZ chassis was specifically-engineered for an even lower placement of the engine. With rear drive, a claimed 53/47 front-to-rear weight split (nearly in Porsche Cayman territory), 200 hp, a fighting weight of only 2,689 lbs, and an ultra-low CG, the BRZ has all the ingredients for knockout fun. Another key feature is the independent suspension with double wishbones in the rear and struts up front. Subaru says this helps the BRZ maintain excellent stability. And the longitudinal direction of the engine and drive shafts, something Subaru uses in all its other cars with symmetrical all-wheel drive, makes for a well-balanced and “seamless” adaption to rear drive. Car & Driver speculates that the base price will be around $28,000. Subaru produced this short video for the BRZ introduction. I don’t know who picked the background music, but it’s awful. Beautiful. Honda should have done an S2000 hardtop. I agree, Honda can’t seem to get its products in order. They needed a new S2000 including a coupe. Finally, Subaru and Scion will have something interesting in the market. Of course, there will likely be a turbo version of this car in a year or two. That should be even more fun! It looks really sweet; fun-to-drive relatively inexpensive coupes are always welcome in my world..